The jubilee year 2000 may well go down in church history as a record year for beatifications and Vatican documents. Despite the frail health of the pope, aides stand actively at attention to help the Holy Father extol holy men, to ban liturgical oddities such as wandering from the sanctuary to bestow the kiss of peace and to rein in loose theological language. One such intervention this summer was a letter, not bearing the status of a declaration but nonetheless signed by Cardinal Joseph Ratzinger and his secretary entitled A Note on the Expression Sister Churches.’ Originally intended as a private admonition to bishops’ conferences and individual bishops, the letter mandates that bishops oversee the way certain ecumenical theologians are talking. Unlike the much noted Dominus Iesus, which was promptly posted on the Vatican Web site, this letter was meant to remain private, not even destined for inclusion in the official log of authoritative decisions (the Acta Apostolicae Sedis). Nonetheless, in the words of the text, it was authoritative and binding in the sense that the pope had looked at it and approved it for distribution to the bishops’ conferences. Somehow the letter was leaked to the public in late August shortly before the stormy international reaction to the more formal declaration. The summer months are a favorite time for Vatican offices to tie up loose ends with directives. Absent from Rome are the university and seminary professors as well as many journalists on vacationsomething that usually facilitates irenic reception of even harsh regulations. Here was a letter decrying equivocations and ambiguities traceable to some [unnamed] theologians who are improperly describing certain non-Catholic communities as sister churches. Since the close of the Second Vatican Council in the mid-1960’s, the letter argued, certain ecumenical enthusiasts had gone so far as to suggest not only that local churches (such as the Church of Lima and the Church of Lincoln) might be sister churches to one another because they all had the same mother, but that the Roman Catholic Church was in fact a sister church to an entire church body such as the Eastern Orthodox Church, or the Anglican Communion or some other break-off community. To speak thus, it was felt, would be to suggest that there is more than one, holy, catholic and apostolic church. It might even mistakenly imply that separated church bodieseven those that have not preserved a valid episcopate and Eucharistmight inappropriately be designated as a sister church, a mistake that even Paul VI had made when speaking of Anglicans in 1970 on the occasion of canonizing the English martyrs. In ecclesiology it is indubitably problematic to use metaphors based on blood tiesfather, brother, sister, daughter, childrenwhen describing spiritual affinities. People do not always use these family terms in the same way that designers of genealogies do. Half-sisters and step-sisters refer to one another as sisters. African Americans typically call Christian women sisters even if their fathers and mothers are not the same. Even the Gospels designate rather loosely Jesus’ brothers and sisters. For me, besides my two blood sisters, my devoted elementary school teachers, the Sisters of Mercy, will always be sisters to me. A number of years ago when visiting Bishop Sarpong of Kumasi, Ghana, I was invited one evening to visit his sister. Only several weeks later did I realize that the woman hostess was his second cousin, rather than his sister. Some years ago the British theologian Rosemary Haughton noted in her book The Catholic Thing that Catholics, to get along in the church, need to learn how to relate to twin sisters. One sister mothers you, fusses over you, tirelessly worries about your welfare and your language, convinced as she is that her will replicates God’s will. At the same time, that sister shares her home with her twin Sophia (who often goes by pet names such as Folly or Inspiration), the unpredictable, spontaneous, venturesome woman not afraid to mix with the neighbors. Judging by the wave of uneasiness observable these days among Catholics (and their neighbors) in the wake of these summer directives, the first sister is currently in control and working hard to police our language. This is not the first time that Vatican officials have worried about the careless use of words. After Vatican II, when theologians were extolling local churches, headquarters stated that it is more accurate to call them particular churches. At synods and audiences, objections were raised about using the word ministry to describe what simple laypersons, especially women, perform in the church. Nor is the expression preferential option for the poor an expression the Congregation for the Doctrine of the Faith favors. Other words with a Marxist whiff about them used by Latin American liberation theologians, such as conscientization, are also shunned. What many Catholics have been perceiving, and I believe quite justifiably, is that the Vatican is sending out mixed messages these days. While the pope is praying with non-Christians in Assisi, asking for forgiveness of the Jews at the Western Wall in Jerusalem, and admitting the sinfulness at least of members of the church (if not the church itself), the Congregation for the Doctrine of the Faith is speaking in terms that sound as triumphalistic as pre-Vatican II, or appealing to an ecclesiology closer to Pius XII’s Mystici Corporis than to that of Vatican II’s Lumen Gentium. In these summer documents, the Pontifical Council for Promoting Christian Unity was clearly not involved or consulted. The Pontifical Council for Social Communication, which might be expected to provide spin doctors to explain restrictive documents and to interpret them for the media, was nowhere to be seen. Is there a kind of tug of war going on among the congregations and councils nowadays? 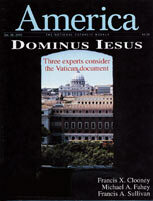 The most notable theological success story of the last 35 years has been, in my view, the involvement of Catholic theologians in the international and national bilateral ecumenical consultations between various churches in response to the mandate of Vatican II to promote the reunion of churches. These consultationsespecially the Lutheran/Roman Catholic International, the Anglican/Roman Catholic International Commission, and nationally the U.S. Lutheran/Roman Catholic Dialogue and the Orthodox/Roman Catholic Consultationhave produced an impressive array of theological consensus statements that have contextualized longstanding grievances between churches and creatively re-expressed in new language the Christian tradition handed down to us from the Apostles. These documents have set a high standard for theological exchange and discourse. These ecumenical consensus statements show how important it is for theologians and others to listen to one another, to accept criticism and puzzlement as helpful instruments and to commit one’s church to the discovery of new ways of responding to the signs of the times. For those involved in this delicate exchange, the sharp exclusivist language of these recent documents presents a painful stumbling block. The declaration Dominus Iesus, especially in what it says about non-Christian religions, echoes the Congregation for the Doctrine of the Faith’s worries about the likes of Jacques Dupuis, Anthony de Mello and Roger Haight, to name only a few theologians. Apart from sexual ethics and feminism, there is hardly a touchier subject these days for the Vatican than interreligious dialogue. Relations with members of non-Christian faiths is a touchier topic than fraternizing with Christian ecclesial communities whose polities are defective. The vast majority of the Catholic faithful are not trained to know what degree of importance to attach to various documents emanating from papal, curial, synodal or commissions’ bureaus. No wonder they are verifiably confused. Who wants to be accused of dissent vis-à-vis authoritative teachings? But who is speaking definitively for the church? In June of this year the official U.S. Orthodox/Catholic Theological Consultation wrote from Brookline, Mass. : We are convinced that a unique relationship exists between our churches in spite of our division. It is for this very reason that in recent times the Catholic and Orthodox churches have been described as sister churches’. That consultation for over 30 years has contributed to Christ’s call for unity in the church as well as specifically to the mission of the Pontifical Council for Promoting Christian Unity, the Vatican curial office with the best track record for openness to participation with other churches as partners. Now it seems that rather peremptorily another curial office is questioning the consultation’s competence to speak the truth with accuracy. No wonder theologians, especially those whose field is the promotion of Christian unity, feel rebuffed by fax messages and convoluted declarations that question their reliability. This article also appeared in print, under the headline "Am I My Sister's Keeper?," in the October 28, 2000 issue.